I was contacted by Wiley Publishing today asking if I would like to review their first fishing book in the "For Dummies" series. Fishing for Dummies is aimed at the UK Angler and has been adapted by Dominic Garrett. Dominic has his own website and blog, they can be found here, there are some excellent fishing related photographs on both! Dominic is an angling writer, blogger, photographer and guide about whom Angling Times recently commented, "Fast becoming one of the most readable angling writers in the business... has that rare ability to convey the magic of the sport". Dominic has produced over 100 articles on a wide range of fishing. As a guide and ex-teacher he has always had a special interest in getting newcomers and especially youngsters into the sport. I entered the Talk Angling 2012 Individual Series via an invite from a fellow MatchFishing Scene member, Nick Roberts, kindly sponsored by Yorkshire Baits. The first match is at Bowsaw and Billhooks Lakes in Hampshire. We all met up just off the M3 and we were soon weaving our way through the country side to the fishery. The satnav would have got me there, but Terry Turnip had a much better route. I decided on a method feeder and pole attack, the picture shows the different lines I chose. Sparky, next to me pointed out the lilly pads near the method line, they were to play a part in my match, but more about that later. Taking a day off work due to the great weather I decided to fish a Wednesday Open Match at Gold Valley in Aldershot. There was 11 anglers taking part and we would be fishing on the Canal Bank of Gold. With so few anglers it was an pleasant start to the day chatting to the lads, many local's so my hopes for any wins looked in doubt from the start, but it's all experience. I pulled out Peg 14 which was to open water thus giving me no islands to target. As the weather had been reasonably warm the previous night, there were plenty of options and as such I set up quite a bit of tackle, having the rods made up already saved a lot of time! 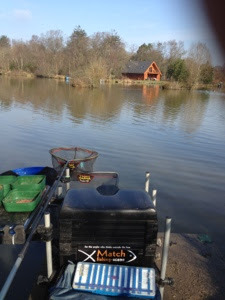 Rick Baxter (Happy Dangler) had organised a Match Fishing Scene Champions League match at Wood Lane in Iver on the match lake. Wood Lane has two lakes on-site. The Match lake is a rounded triangular shaped lake. Rick had divided the 21 anglers into three sections of 7. Each section on a different bank. Weather for the day was overcast and slightly damp. My draw bag luck hasn't been the best and I pulled out Peg 1, the closest to the carpark but a peg which would be difficult to fish the pellet waggler or bomb rod as pegs 3 and 33 cut off peg 1's access to the centre of the lake. 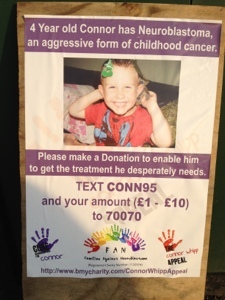 Brian Green, Proper Tidal Boy on Match Fishing Scene had organised a charity match for his nephew, Connor Whipp who has neuroblastoma a form of childhood cancer. 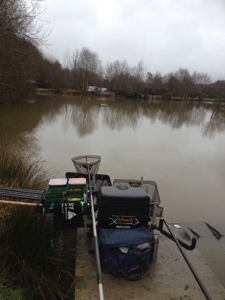 The venue was Sivyers Lake a premier water that is for exclusive use by the Feltham Piscatorials. Arriving at Sivyers Lake we were greated with lovely sunshine and a great looking lake. The draw would be a "walk off" draw. Basically, you are drawn a number, this number relates to begin able to walk off and select the pegs of your choice. Mark had come down to London for the weekend so we could fish Gold Valley and also at charity match at Sivyers Lake. The weather had definately warmed up so we were both looking forward to some Gold Valley Carp. All lakes were open so we decided to fish pegs 56 & 57 on Gold Lake. Mark chose the infamous peg 57 where he could cast to the little bay outside the clubhouse steps where the water is deepest. Andy Gregory and Barry Parker came over to say hello. They were fishing a match on the Basingstoke Canal. We had both decided that we would have a day on the rods rather than breaking out the poles. Bait for the day was soaked micros and groundbait for the method and cage feeder, 8mm pellets, corn and dead red maggots. Method feeder, 10' bomb rod, 6lb mainlineWaggler, 11'6" Float rod, 4lb mainlineBomb / Small Cage feeder, 10' bomb rod, 6lb mainline, 20" hook length Mark had also set up a method feeder and waggler. 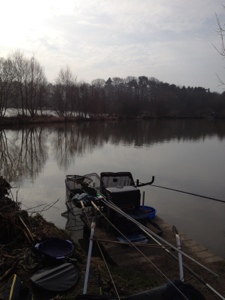 Stafford Moor Fishery is a fantastic fishery run by a very helpful owners, Andy and Debbie Seery. After spending a week at the fishery staying at the what can only be described luxurious lodges I feel that I can give all blog readers an insight into this jewel in Devon. The Lodges I stayed in Maple Lodge, which is the first lodge on the left as you enter the fishery. 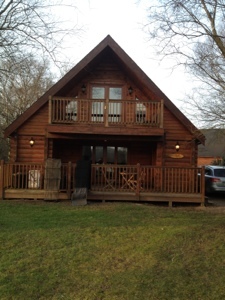 Sharing the lodge with me where two other MatchFishing Scene members, Andy G and Rich H. As you can see by the picture, the lodges have a wide balcony both on the ground and first floor, the only thing you need to watch out for is slipping in your wet boots. Final day fishing at Stafford Moor and Herbie had organised another MFS Champion League match with both a Carp and Silvers Pool, so I was looking forward to getting the rods out and trying to bag some large Stafford Moor Carp. The match would be over both Woodpecker and Tanners with Woodpecker being the favoured lake as the carp had been showing a lot over the week. I drew out peg 1 on Tanners. Andy, Stafford Moor fishery owner said that the wind was blowing out of the peg and it would be tough for me, but thats the luck of the draw bag. Peg 1 on Tanners is an end peg, the lake curves around from the left side up to Peg 36. It was clear that fish were feeding as you could see blowing in the calm water and Chris Haines next to me on peg 3 had mentioned that I would need to chase the fish up that bank. Final day of the MFS Stafford Moor Silvers competition.